In the year 1748 James Douglas, 14th Earl of Morton, presented an Egyptian mummy to the Faculty of Advocates. It is not clear exactly why the Earl chose to bestow this gift but it was duly accepted and “set up in their Library”. The Advocates Library was always more than just a repository for books. From the earliest times Members were collecting artworks and curios as well as books and manuscripts. The Library became something of a museum and guests were often shown round the exhibits. The English writer Samuel Johnson was once given a tour of the Library by his friend and biographer James Boswell, advocate. Although the mummy would have been in residence by that time, Boswell fails to mention him. 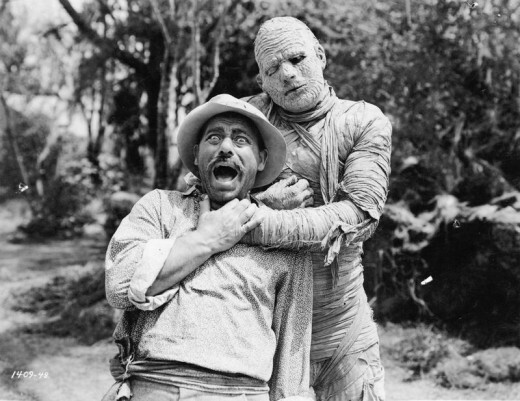 During its time in the ‘dark corners’ the Faculty Mummy suffered more indignities than the average Egyptian gentleman is used to. From having his wrappings partially removed by some curious person, to being used for bayonet practice by the Members’ Rifle Corps (according to Faculty lore)! 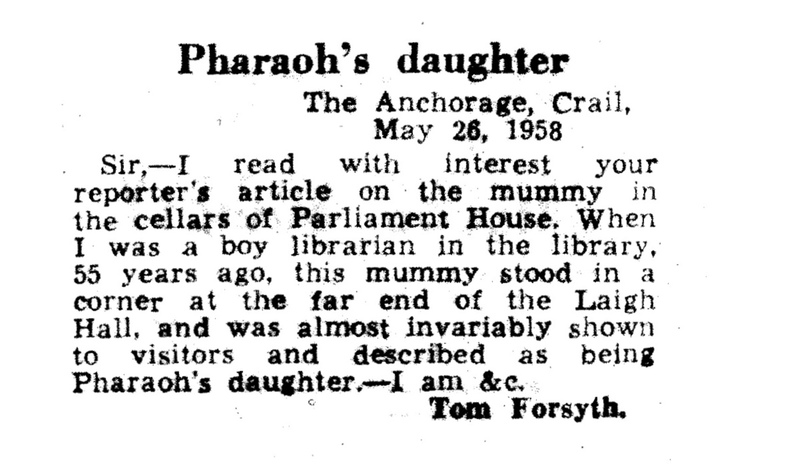 Worst of all, it seems to be during this period that the Mummy came to be known as “Pharaoh’s Daughter”. On the plus side, he did have a standing invitation to the Faculty Annual Dinner where, we are told (by the lore again), songs were sung and toasts were drunk to the health of the Pharaoh’s Daughter. In his accompanying letter W Beattie, National Librarian, is rather understating things with the comment “the enclosed report…is, I’m afraid, disappointing for you”. Attempts were made to locate other museums interested in taking him – none were found. ‘For sale’ adverts were placed in the papers – there were no takers. When the Faculty at last tried to just throw the Mummy away, even the Council cleansing department refused to uplift on the grounds it was human remains – but remains which could not be buried without a death certificate! Following publication the story was picked up by newspapers around the world. The Faculty began receiving letters from such places as Holland, Germany, Belgium, France, Switzerland and Australia – as well as from closer to home. While many of these correspondents were offering the Mummy a new home, some just wrote tendering unhelpful advice on the predicament. Until, that is, I decided to do some research of my own. Starting with the Mummy’s last known address, I contacted Glasgow University. Learning that, on Dr Sandison’s death in 1982, his collection of antiquities passed into the care of The Burrell Collection in Glasgow, I contacted a Senior Curator there. He was able to confirm receipt of ‘The Sandison collection’ in 1982. He was aware of two mummies that were being kept in storage, neither with proper provenance… nor a head. I was able to say, with a modicum of certainty, that the tatty auld bag of bones was likely to be the former Faculty Mummy. Unfortunately the storage facility was at that time inaccessible so I was unable to visit the Mummy myself. However, I did pass on some information – gleaned from the museum report of 1954 – about the condition of the Faculty Mummy’s wrappings and coffin at that time. This may help The Burrell Collection make a definitive identification once they again have access. It may also be possible to identify which of six mummified heads may belong with ours! A version of this story was originally published in 1958 by The Scotsman newspaper. This post was inspired by research I carried out in 2008 for an internal exhibition at the Faculty of Advocates. The exhibition was based around the unique and wonderful ‘Mummy file’, a collection of letters and newspaper clippings held in the Faculty’s archives. These items were gathered following the huge (and hilarious) interest generated by the Scotman article – a copy of which was included in the file. The collection of letters is a treasure but, since they are physical items (and don’t belong to me), I couldn’t post them here. I could however recount the wonderful story behind them. I am always scrupulous about citing my sources. 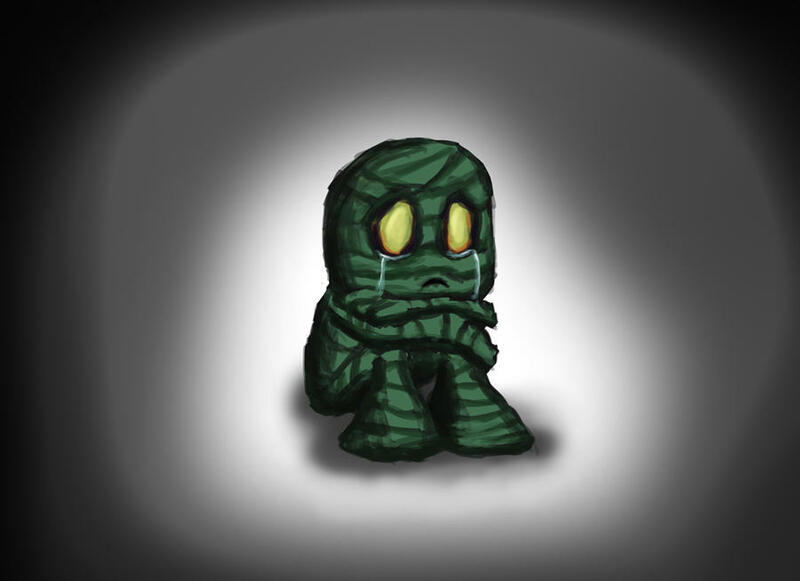 However, when I first wrote this post (originally entitled The sad history of the Library Mummy) it was a only a short and entirely anonymous reminder of an enjoyable research project. I always prefer to keep posts anonymous when possible. References to the FoA were only added recently, after I received interest from that quarter. At that time, I omitted to cite a work by Mr Iain Gordon Brown since I didn’t quote from it in the post. However, it was a handy guide to the background story and a resource I used alongside the ‘Mummy file’ and the Minute Book of the Faculty of Advocates. I also investigated methods of mummification via Google! I apologise to Iain Gordon Brown for hurting his feelings. It was not intentional. I sought only to write a nice wee story. In order to avoid any further unpleasantness, here is a complete list of citations as they appeared in the full text of my exhibition, as well as names of the lovely people who helped with my enquiries. Extra special thanks are due to Simon Eccles for his kind assistance. An EDIT of a fun post from May 2015.